In most genes, the genetic code is located on several small exons, interrupted by introns: larger pieces of non-coding DNA. During pre-mRNA splicing, introns are removed and exons are joined to generate a messenger RNA that can be translated into protein. Splicing is coordinated by a catalytic complex called ‘spliceosome’, of which the most important proteins are 5 small nuclear ribonucleoproteins (snRNPs): U1, U2, U4, U5 and U6. Each snRNA consists of an RNA and a functional protein. Introns have a donor (5′) and an acceptor (3′) splice site and a branch point sequence. These are characterized by consensus nucleotide sequences, which are recognized by the RNA part of the snRNPs. A simplified depiction of the splicing process is shown in figure 1. 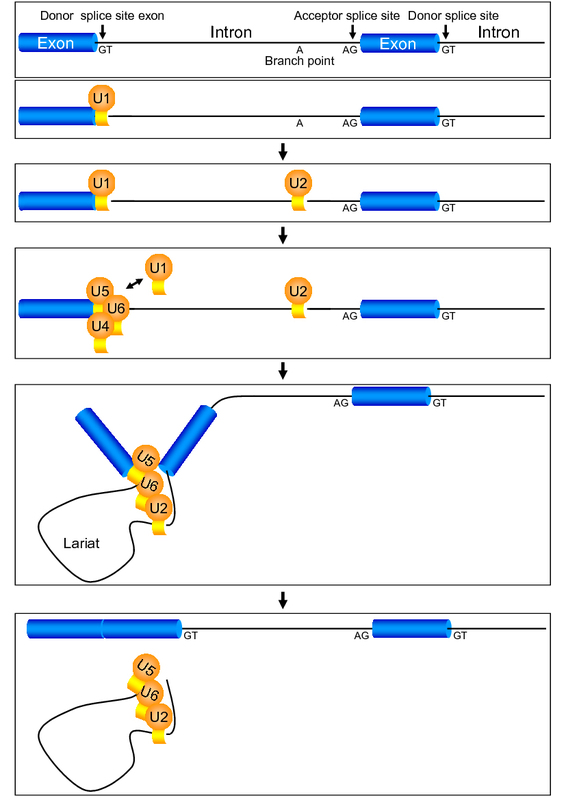 Splicing is initiated by the binding of U1 snRNP (U1) to the donor splice site. U2 snRNP binds to the branch point. Subsequently, U1 is replaced by a complex of U4-U5-U6 snRNPs. After U4 snRNP is released, U6 and U2 can bind, producing a lariat. Then the intron is cleaved from the RNA and the exons are joined. This process is repeated until all introns in the pre-mRNA of a gene are removed.